By now, social impact organizations should understand the importance of two elements of nonprofit fundraising: 1) storytelling, and 2) demonstrating their impact in the field. Merging these two ingredients can engage your audience, compel people to action, and offer proof of your organization’s programs. After a project is completed, most nonprofits offer at least a blog post, video or photo collection to tell the story of their finished work. But your storytelling doesn’t have to start with the ending. You can pull your audience into your narrative well beforehand: by broadcasting your events or projects as live impact stories. In other words, if you’re working on a 3-week well project, or school-building program, don’t wait until you have the finished product to tell your story. Treat those three weeks as part of your narrative. Turn your amazing projects into compelling stories, into high-quality content that attracts a viewership – and pulls people along for a ride. In this post, we’ll discuss why and how you should unlock your impact story piece by piece, and ultimately create a richer, more engaging narrative that captures and sustains people’s interest. So you’re in the middle of that 3-week project, and you’re ready to blast your audience with everything they need to know. Images, videos, blog posts – anything documenting your work-in-progress is about to flood supporters’ newsfeeds. But hold on. It isn’t enough to have good content. You have to shape and deliver your content in a compelling way. Good stories have a plot arc. There’s intentionality behind every event, every scene; it makes you want to turn the page. The same goes for your live impact story. Rather than offering all your goods on a platter with no mystery left unsolved, you need to create a communication cycle that will intrigue supporters to follow along as your project unfolds. You’re aiming for engagement, for people to click to the next part of the story. This requires you to map out your content strategically according to the timeline of your project, the nature of the content, and the platform you use. While you should obviously broadcast updates in chronological order, today’s technology makes it possible to engage your audience using a variety of digital tools and media. Consider breaking up parts of your story and artfully weaving your content across different platforms. 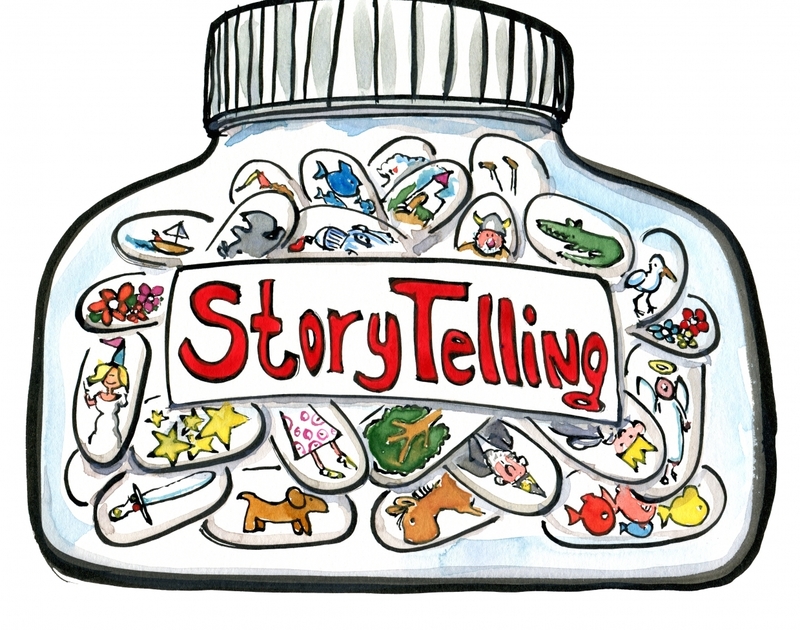 This type of “transmedia storytelling” – the technique of developing a story across multiple media – will form a larger, more cohesive and enjoyable experience for your audience. This means putting the right content in the right place at the right time, and linking the pieces together in a way that makes sense with your narrative. Let’s dive into some tips on how to build and broadcast your story and engage your audience across different platforms. Launch your impact story with a good hook – whether by introducing the issue, your character, and/or throwing your reader in medias res – that makes supporters want to find out what happens next. While you can begin your story on any platform you want, one excellent way to start is through email. A well-crafted email can capture readers’ attention and trigger engagement, even among people who may not be regular visitors to your website. Introduce your project or profile, and then ask people to click through to the next step, whether it leads to your website, blog, a campaign micro-site, or a fundraising page. LiNK, for instance, sends out an email series of “rescue stories” from the ground. 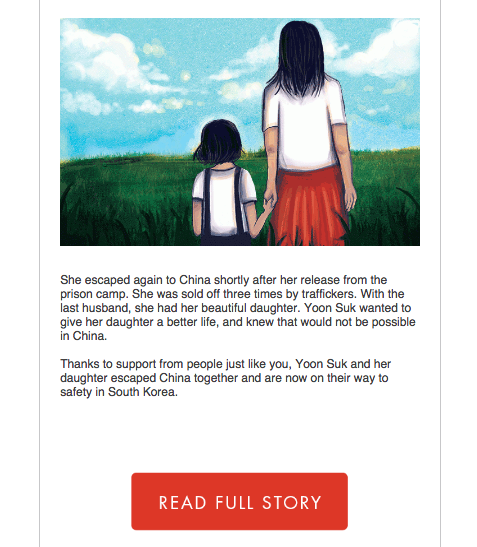 They usually have a short snippet introducing a beneficiary, followed by a CTA stating the next specific action to take – “Read Full Story.” I also love how this particular email uses hand-drawn illustrations instead of photos. While it probably serves as a safety measure for the beneficiary, it’s still a creative medium that adds an unexpected twist to the typical text/photo email. Cue intrigue. After clicking, readers are taken to the organization’s blog for more information. However, your breadcrumbs don’t have to just lead your blog. You can direct readers to other platforms too. Check out what charity:water does with their hook. Although their email approach and CTA are similar, their button links to an article on Medium instead. 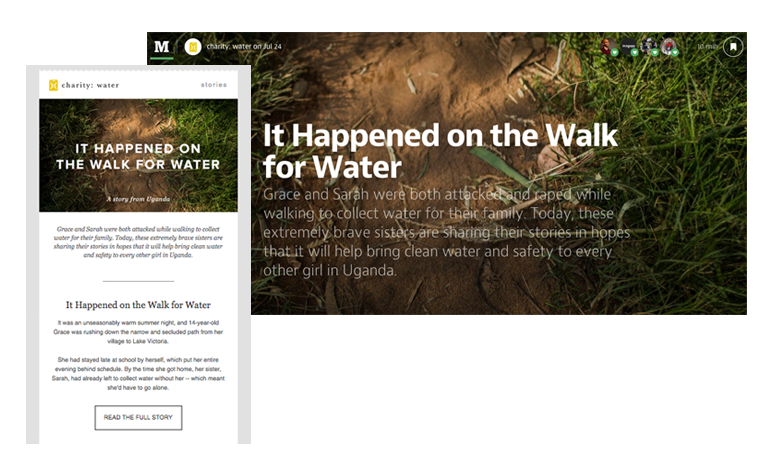 A platform built for storytelling, Medium connects readers to compelling narratives, while blending text, images and videos in beautiful ways that might be too complex to do on your own blog. 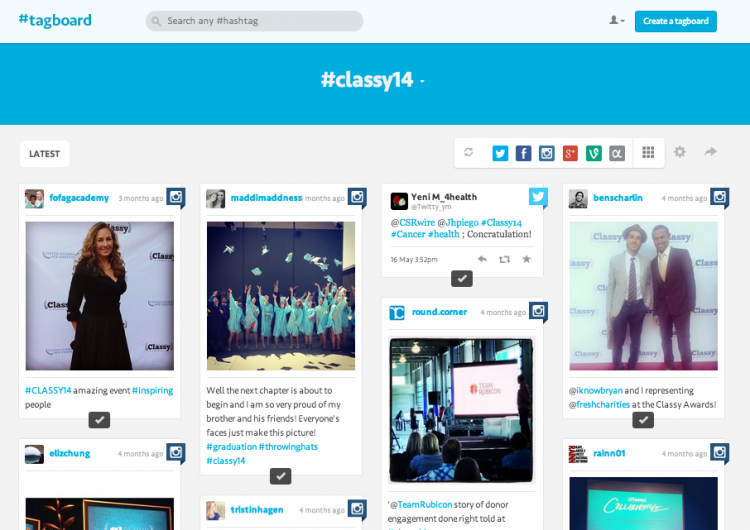 Create a hashtag for your project, campaign, or project. This links all of your content together, makes it discoverable across social networks, and allows supporters to follow along at any point in your campaign. Each social platform serves a different purpose, so think about how you will distribute content on different accounts to get the most engagement. However, TR uses their Instagram account to give supporters a more personal take on the operation. 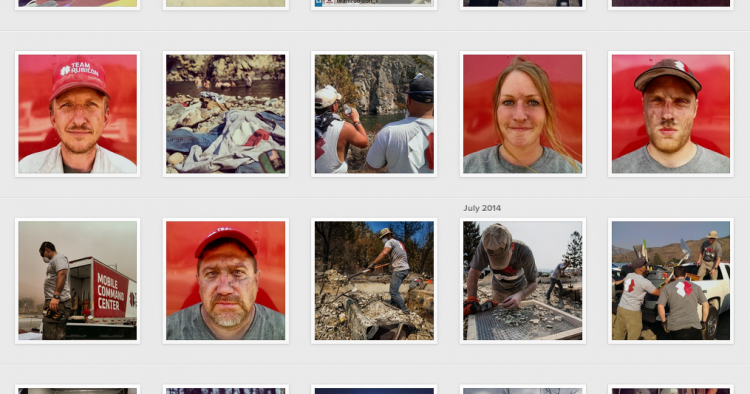 Searching #OpHumbleTrooper on Instagram reveals a string of portraits of their veteran volunteers. While Twitter is conducive to news or updates, Instagram’s brings followers up close and personal with Team Rubicon’s story. To conclude a school-building project, buildOn filmed their student volunteers sharing about their rewarding experiences in the field. While the video is uploaded on YouTube, they also cross-promoted it on Twitter to reach a larger audience. A unique element of transmedia storytelling is its interactive nature. When you use different platforms, especially social networks, invite people to dialogue with your story and enter an ongoing conversation. This gives you the chance to feature supporters as contributors and characters of your story. Crowdsource and repurpose content created from your audience. There are a number of tools that help you aggregate and curate content, like Storify, Instagram’s public API, and Tagboard. Collect content with event-specific tags, pull it into a gallery, and display it on your website or blog. Create a broader, more dynamic storyline around your next project or event. Building a live feed of content, using a range of online tools, will create – and sustain – a richer experience for your supporters, compelling them to follow along with your activity. Make sure to build in calls to action within your chapters so your audience knows what to do next. Strategize your content production and your story will come to life!